Anyway, Katra Laidlaw has been working on the Monkey Bridge Project for the last four months. 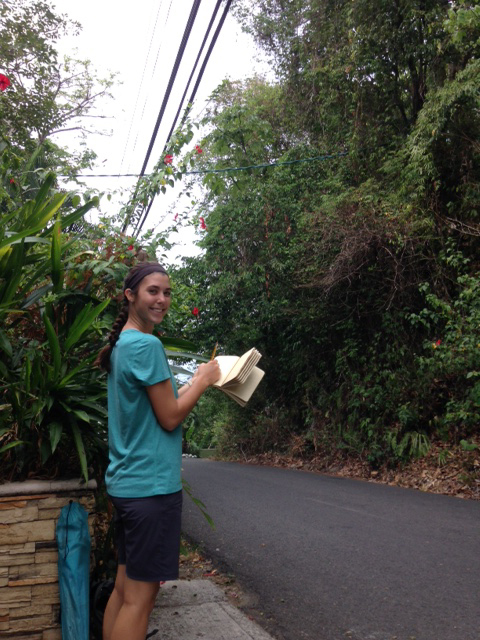 While we were in Costa Rica, we got to learn more about the project, and more about Katra. It was these simple rope bridges, that, 16 years after their installment, brought environmental studies student Katra Laidlaw all the way from Northeastern University in Boston to Quepos, Costa Rica. The purpose of Katra’s independent study is twofold. The first is to monitor the daytime and nighttime usage of the bridges along the main road and smaller roads. The second is to conduct daily observations of the bridges in order to determine whether wildlife use them more or less than they use unintended crossing structures (i.e. telephone wires and electric cables). In addition to conducting daily observations, Katra works with the local electric company, ICE, to maintain the rope bridges. 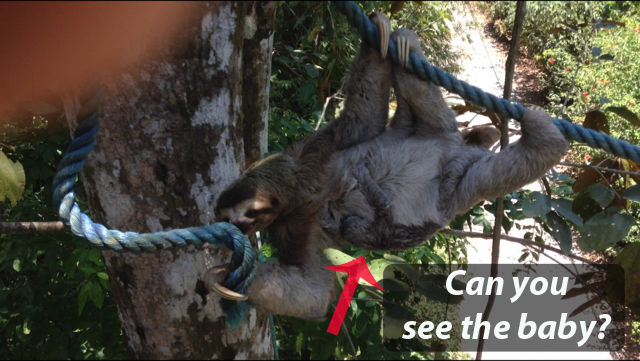 Since their installment, at least 14 different species of animals, including sloths, porcupines, and even anteaters have been seen using the rope bridges (Pía 2012). When most people think of the effect roads have on wildlife, the gruesome image of an animal hit by a car might come to mind. But the effect that roads have on wildlife is not limited to roadkill. Roads contribute to habitat fragmentation, the interruption of natural water systems, changes in microclimates, noise pollution, air pollution, erosion, the hunting of wildlife, and even the movement of invasive wildlife. The field of road ecology has expanded in recent years, but there is much that we still don’t completely understand. For example, the effects of roads for some species can be felt as much as 250-1000 meters away from the road’s edge (Eigenbrod et al. 2009). Although we are still coming to understand the full extent of the effects roads have on ecosystems, they have been described as “the sleeping giant of biological conservation” (Forman 2002) and the most destructive single contributor to habitat fragmentation (Noss 1993). Concerned citizens, scientists, non-profits, and engineers have created wildlife crossing structures to help mitigate the effects of habitat fragmentation caused by roads on wildlife. 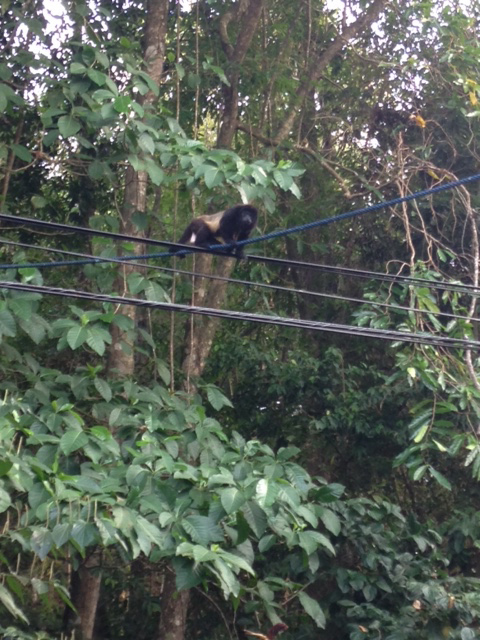 We saw this lone male howler monkey using one of the rope bridges Kids Saving The Rainforest installed near the El Parador Hotel in Manuel Antonio. Photo provided by Katra Laidlaw. A wildlife crossing structure is a physical structure that enables the safe passage of wildlife over or under roads or other types of linear infrastructure, and in the case of roads and railways, helps to prevent vehicle-related deaths (Rodney van der Ree et. al 2007). For example, wildlife crossing structures over a road could not only provide a safe way to cross the road but could also serve to link up fragmented habitat and potentially reduce the risk associated with other types of road-related infrastructure, such as powerlines. This was the hope of the wildlife rehabilitation center, Kids Saving The Rainforest, when they installed more than 130 rope bridges in the Manuel Antonio/Quepos area in Costa Rica in 2000. The rope bridges consist of a two-inch nylon rope tied from one tree on one side of the road to another tree on the other side. They were originally designed for the endangered “titi monkey” as the locals call the grey-crowned Central American squirrel monkey (Saimiri oerstedii citrinellus). Although it is good news that the rope bridges are being used regularly by many different types of wildlife, including the endangered titi monkey, without knowing the populations of animals that live in the area, one can’t be sure that the bridges are doing enough. If not enough individuals cross the bridge to maintain the genetic diversity of the population in the area, the bridges have not sufficiently mitigated the effects of habitat fragmentation. In other words, monkeys can be crossing the bridges while the overall population continues to decrease or become increasingly inbred due to the lack of contact between different troops. In order to know whether the bridges are doing enough for the endangered titi monkey, a census is needed. This is exactly what the local organization, the Titi Conservation Alliance is trying to achieve. The Titi Conservation Alliance consists of a coalition of concerned individuals and hotels in the area who are working to protect the endangered titi monkey. If the funds for a proper census can be raised, not only would it be an important update for this once critically endangered species, but it would be essential for a study on the effect the rope bridges have on the population of titi monkeys. This type of study would offer valuable insight to the other wildlife crossing structure projects in Costa Rica and to the field of road ecology in general, since wildlife crossing structure studies that incorporate population data are few and far between. 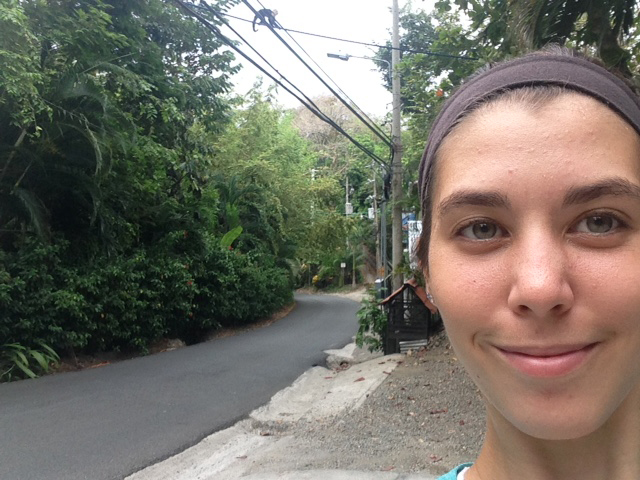 So although it is unclear whether the rope bridges in Manuel Antonio help wildlife on a population level, they most definitely help on the individual level. Each wild animal that uses the rope bridge to safely cross the road is an animal that does not have to risk losing their life to accomplish daily tasks such as finding food and shelter. And especially in the case of an endangered species like the titi monkey, every individual counts. If you would like to help support the continued efforts of installing and maintaining a monkey bridge, you can easily ‘Sponsor a Monkey Bridge‘ at the Kids Saving The Rainforest site. Well that is all for this week’s story! I hope you learned a lot about the great work Katra and others are doing to try and save animals and that just maybe you too will find your calling in one of my articles and be inspired to stand up and make a difference for animals everywhere. Stay tuned next week as we learn all about the Orangutan Letter Writing Campaign. 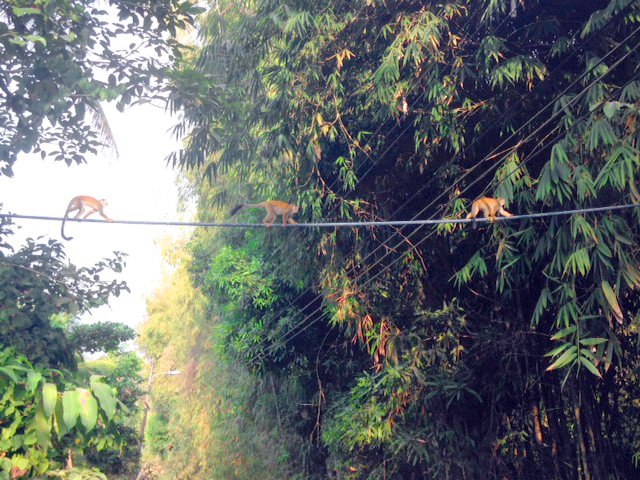 Pingback: Monkey Bridges For Everyone — Nat Geo Education Blog – Welcome to the World of Ekasringa Avatar!